Next Level Custom Signs specializes in auto dealer signage. Here are a few of the available auto dealer sign products. We are always adding new auto dealer sign products to our site. We have hundreds of unique sales, showroom, service and parts department signage available that is not yet on the site. If you need anything related to auto dealer signage Next Level knows how to get it done at a fair price. Drive in your drive by traffic with our custom Next Level Boulevard Signs or a custom sales event sign package. We can bring your dealership to life, with a full color wall graphics and banners. Notify passers by of your dealerships sales and service specials with our outdoor advertising signage. Are you tired of the mess from painting your store windows, we have a new repositional adhesive vinyl that can be digitally printed for window advertising? We also have a full service graphic design department that specializes in the right look and feel for your auto dealer signs. We have a state of the art facility than can produce almost any project that you need. Please call today 888 578-8100. 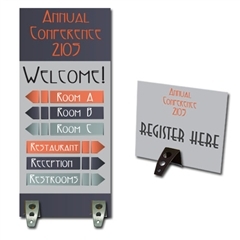 Double L Floor Sign Base - Various Sizes Adjustable Double LL Floor Signs - Various Sizes Monster Floor Stand - Slide In Frame 24" x 36"
Perfex Pedestal Floor Stand - Various Sizes EasyOpen Snap Frame Menu Stand-17" x 11" to 22" x 14" Black Magic Floor Stand - Slide In Frame 22" x 28"
Sturdy Poster Sign Holder - Slide In Frame 22" x 28" WindMaster Classic - Outdoor Sign - Snap Frame 28" x 44" Signicade Deluxe - Plastic A Frame - Slide In Frame 24" x 36"
Signicade Plastic A-Frame Sign - 24" x 36" Signicade Sidewalk Sign with Adhesive Vinyl Prints - 24" x 36" Long Elliptical Sign Holder - Slide In Frame 22" x 56"
Adhesive vinyl graphic inserts included! Durabase Sign Holder Pamphlets Pockets - Slide In Frame 22" x 28" Durabase Sign Holder Literature Pockets - Slide In Frame 22" x 28" Poster Signholder - Pamphlet Holder - Slide In Frames 22" x 28"
Great selection of auto dealer signs at low prices. Car lot signs include auto dealer sales event sign packages, pole signs, sales, service, showroom and parts department signage. Next Level Custom Signs is your dealerships number source for auto dealer signs.